They don't taste like soap. 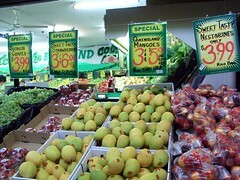 You smell them before you taste them, even just as you walk past the greengrocer you can smell them, sweet in the air. Eating them is a messy summer treat, the flesh slippery with juice, your fingers dripping - eat them outside in the sun (or prepare them genteely and eat the pieces with a fork from a glass dish - but you still have to watch out for drips).